The Zymatic was an ambitious opening preceding an even more ambitious appliance. I’m in my mother’s kitchen in Los Angeles drinking a beer with my sister on a hot spring afternoon. The beer is a bready, hoppy IPA without any overwhelming flavors that would make you think too hard. The alcohol content is acceptable. The brew is properly carbonated and doesn’t taste flat. This beer isn’t going to win any awards, but I could serve it to friends and family without having to apologize for it. In short, it’s easy drinking, something you can have a conversation over. The beer, however, came from a beer-making machine on my countertop, which was why the overwhelming averageness of the brew instead felt amazing. Maybe that’s a low bar to clear in order to merit applause, but given my past experience with the PicoBrew Zymatic, it felt appropriate. In 2015, I reviewed the Zymatic, a large machine that was supposed to help brewers cook up their wort automatically—but the fermentation process was largely left in the hands of the Zymatic owner. 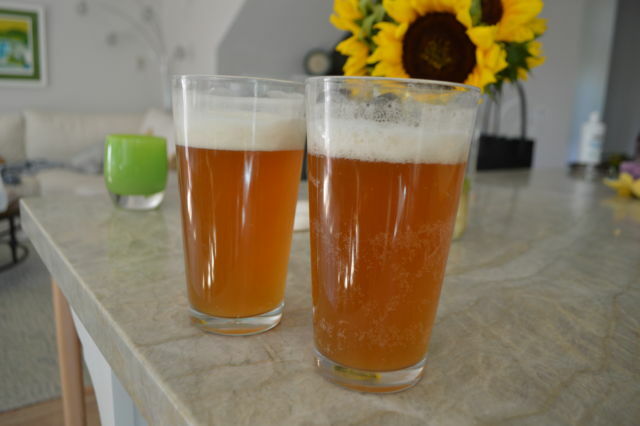 I produced two below-average beers, perhaps owing to the heatwave I was brewing in at the time (the temperatures surely killed off some yeast). But another part of the problem with the Zymatic was that it combined a machine-driven brewing process with the traditionally hands-on fermentation, bottling, and carbonating processes. It was hardly the “set-it-and-forget-it” appliance that I expected. This particular beer I recently drank, however, came from the second iteration of PicoBrew’s home beer-making appliance: the PicoBrew Pico (yes, somehow someone decided that was the right name for it). The second-gen appliance has its problems, but it has also improved from the previous version in many ways. Most of all, I’m interested in watching PicoBrew try to solve a problem no one has (that is: “I’m bad at making beer but buying beer from a liquor store is too mainstream for me”) in a way that’s actually clever. 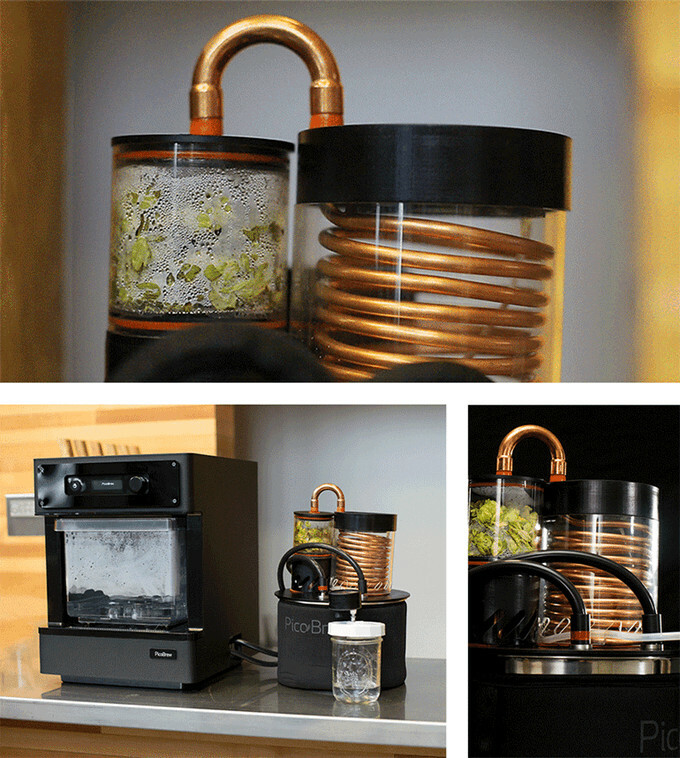 I probably wouldn’t shell out $800 on this appliance, but Pico beer making has gotten a bit more compelling. The Pico is about two-thirds the size of the Zymatic, so while it actually does fit on a countertop this time, it’s still about the size of a microwave. The Pico probably wouldn’t be a fixture in any but the largest kitchens. Operating the Pico requires less work than operating the Zymatic. That comes with a tradeoff, though: you can only brew with PicoBrew’s pre-packaged, proprietary PicoPaks. (Yes, “pack” with no “c” because how else is PicoBrew going to maintain that Silicon Valley glamour?) The “Paks” come with an RFID tag that the machine reads before you start brewing. While this is generally a cringe-worthy way to create repeat customers out of one-time appliance sales à la the Keurig or the infamous Juicero, take a deep breath if you find your fingers getting hot and twitchy with the urge to write a rage comment. For one, the PicoPaks are compostable, so you’re not doing the same damage done by plastic coffee cartridges or worthless juice bags. Also, PicoBrew’s website allows you to buy custom Paks through the "PicoBrew Freestyle” portal (a ripoff of Coke Freestyle machines, perhaps?). Once you insert a Pak, you can have the machine make adjustments to brewing temperature and time to reach desired bitterness levels and alcohol content (ABV, or alcohol by volume), for example. The purist will note that you can’t make any kind of PicoPak you want in the PicoBrew Freestyle market—they will stop you from adjusting a recipe’s ratio of certain kinds of grain after a while. This appliance comes with defined boundaries of all kinds. But it’s also not going to force you to choke down a narrow variety of hand-curated concoctions. PicoBrew is positioning itself to be a sort of rare-beer distributor, courting breweries of all sizes to “get in the marketplace” by creating their own PicoPaks that Pico owners can buy. So if you’re a brewer in Washington state that makes a rare Amber but you can’t afford to ship it to devotees in Nebraska, you could, theoretically, contract with PicoBrew to build and sell the, um, “raw” form of your beer. When you order a PicoBrew Pico, it comes with a whole slew of parts besides the machine itself. 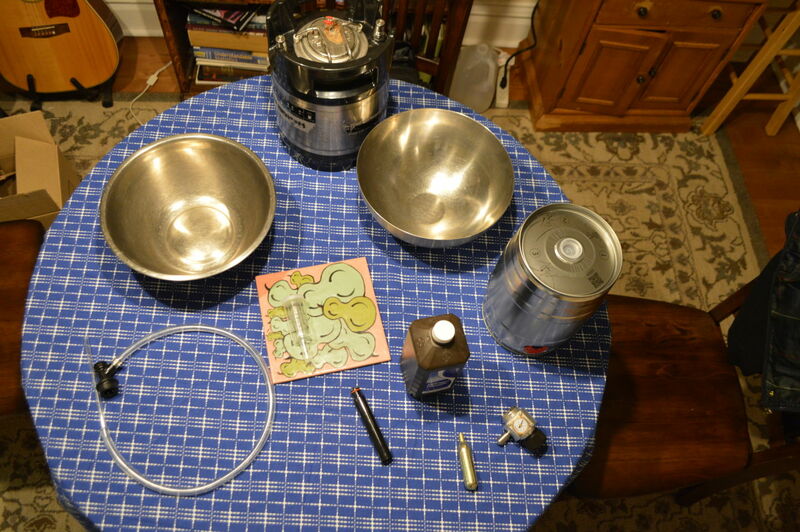 You’ll get a small brewing keg and a similarly sized serving keg, as well as a box of components including a CO2 regulator and cartridges, an assortment of cleaning pipes, a small packet of powder detergent for cleaning components after you brew, and an assortment of plugs and lids for the kegs. For all the components you’ll encounter, there’s not a lot of mechanical setup necessary on the machine right off the bat. Setup was just as easy on the Pico as it was on the Zymatic: connect to the Internet and your PicoBrew account, wait for any outstanding firmware to download, and you’re ready to do a first rinse of the machine. The setup process is made extra-simple here because you don’t have to go to the PicoBrew Web interface to add the next recipe you want to brew—the machine will automatically know that information when it reads the smart label on the PicoPak you insert. After I unwrapped the Pico carefully and connected it to my home network, the screen on the appliance walked me through my first rinse. In general, the Pico’s screen prompts you through the cleaning and brewing process, but I leaned heavily on the spiral-bound IRL manual that came in the box because it was more detailed. First rinse was easy enough, so I started brewing. I filled the brewing keg with a gallon and a half of distilled water and added another gallon to the machine itself (more on why distilled water is called for below). I unwrapped the PicoPak and the accompanying hop package that PicoBrew sent me and inserted them into the drawer of the machine, which PicoBrew calls the Step Filter. The Pico registered that I wanted to brew a Half Squeezed IPA, and I used the Control Knob to commence brewing. The machine started making all the whirring and gargling noises I was used to on the Zymatic. I went into the next room, reclined on the couch, and picked up a book. But about 45 minutes into the two-hour cycle, my ears picked up on an odd noise. The coffeemaker-esque dripping noises sounded like they were coming from outside the Pico, not inside. I ran to the kitchen and, sure enough, grain tea was leaking from the machine all over my kitchen floor. The leak didn’t seem big at first, so I put a towel under the machine and a bowl on the floor. I double-checked the ball locks on the keg in case maybe one wasn’t on correctly and it was backing up water through the hose or something. I checked to make sure the Step Filter was properly pushed into the Pico. Everything was locked in place. I let the brew cycle run all the way through, hoping I could still get wort from it. But, ultimately, the leak left me too little liquid to work with. Despite having followed all the instructions, I was convinced some carelessness on my part caused this. I rinsed the whole machine out, defeated. Luckily, PicoBrew sent me two PicoPaks, so I went to the store the next day, bought several more gallons of distilled water, and ran the thing again, double- and triple-checking every step. Again, some kind of leak poured a third of my wort onto my kitchen floor to my dismay (but to the great amusement of my dog). Evidently, the angels were getting pretty aggressive in taking their share. I still assumed I was doing something wrong, but I needed someone to tell me what it was. I e-mailed PicoBrew, and someone called me back immediately. Had I checked that the ball locks were on properly? Yes. Was the Step Filter properly pushed into the Pico? Yes. What did the holes on the top of the Step Filter lid look like? Well, there’s four in a row toward the back, one in front of that row on the left, and then one in front of that towards the center. There’s your problem, the PicoBrew representative told me. The lid is upside-down. That middle hole should be on the right. In my defense, there was no way for me to tell that the lid, made of clear fiberglass, was upside-down. The lid fits into the Step Filter despite its upside-down or right-side up orientation. 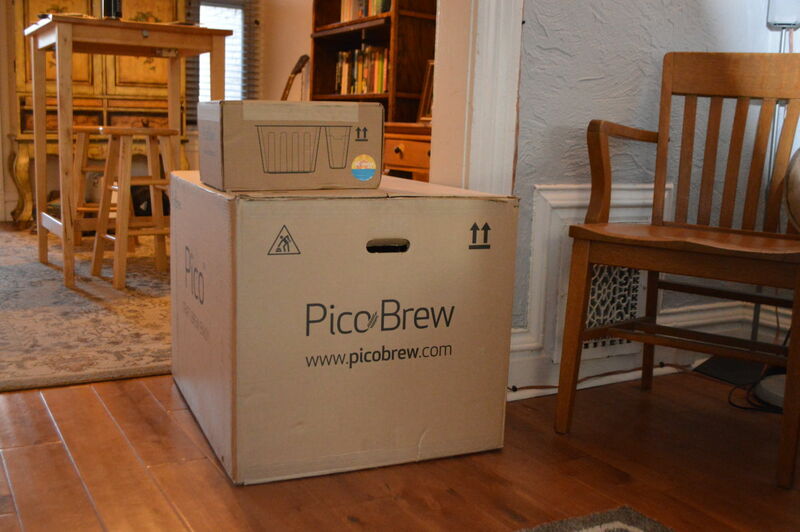 PicoBrew explained that it had sent me a prototype version of the Pico. So rest assured, dear readers, the version going out to customers now apparently has clear marking on the lid of the Step Filter to keep this problem from happening to you. But this conversation is also how I learned about a key difference between the Zymatic and the Pico. The Zymatic filled the Step Filter with heated water via a rotating arm. The water collected in the Step Filter, mixed with the loose grains, cascaded through the hops containers before being pumped back out to the keg, where it awaited yeast and fermentation. The Pico, however, uses steam injection to force hot H2O into the wort as it passes through the machine. A magnetic valve system in the upper part of the machine decides where to direct the liquid: through one of the six holes that drain into the Step Filter, depending on what point you’re at in the brewing process. The grain bin of the PicoPak and the accompanying hop containers act like giant tea bags, but very little of the liquid is meant to collect in the Step Filter itself. That’s all drained through a hole in the bottom of the Step Filter and pumped back into the brewing keg for recirculation through the system. On the Pico, there’s no moving arm distributing hot water to account for (meaning the machine can be smaller), but there are small holes in the machine above the Step Filter that directly correspond to the placement of each hole in the Step Filter lid. Thus, an upside down lid created a small flood that resulted in a beery Niagara Falls in my kitchen. Despite the lid issue, the steam injection method of heating the wort is an interesting choice. PicoBrew applied for a patent on the steam injection method in 2015 and was granted it this past January. One of the cool things about the Zymatic was that it doubled as a sous-vide cooker. Just throw food in a ziplock bag, put it in the Step Filter, and the Zymatic would create a bath and circulate the water for however long you needed, maintaining a constant temperature. The PicoBrew Pico doesn’t have that function immediately out of the gate, but the company just released an adapter and a firmware update to make sous-vide meals possible. Vice President of Sales and Marketing at PicoBrew Donald Brewer (yes, that’s his name) said the adapter is basically just a snorkel that you attach to the drain hole on the Step Filter to allow water from the brewing keg to pool in the Step Filter. Ars didn’t have this adapter, so we didn’t try out the sous-vide functionality. One of the advantages of the steam injection method is that it keeps the lines in the machine relatively clean and kills many bacteria that might otherwise grow in there, eliminating the need to sanitize the whole machine. It also allows the appliance to adjust the temperature of the wort by adding more steam. Directly heating wort to boiling can create difficult-to-clean sugar residue, but steam injection minimizes that. Luckily, PicoBrew does all that accounting for you. You just need to buy distilled water to prevent mineral buildup in the lines, the company says, and follow the directions. So, after I ruined two batches of beer with a lid error, I finally brewed a batch that stayed within the confines of the machine. After letting the wort cool down overnight, the time had come to add yeast and ferment. This is another part of the beer-brewing process that PicoBrew has tweaked to make a true countertop brewing machine visible on the horizon. Generally with home brewing, you’re waiting two to three weeks after you brew for the yeast to ferment your wort before you can bottle (and then if you use priming sugar to bottle-condition your beer, you have to wait longer still). But the Pico’s brewing keg is designed to force a much shorter fermentation time—for the Half Squeezed IPA, that time could be anywhere from four to seven days, depending on how warm you keep the wort. The PicoPaks come with a temperature-sensitive decal that you slap onto the side of the keg to gauge how warm that wort is. This fast fermentation is possible because the brewing keg is built essentially like a pressure cooker. If you keep the yeast warm, they’ll eat through the sugars in the wort more quickly, releasing carbon dioxide more quickly as well. This increases the pressure in a container unless there’s a suitable release valve for that gas. 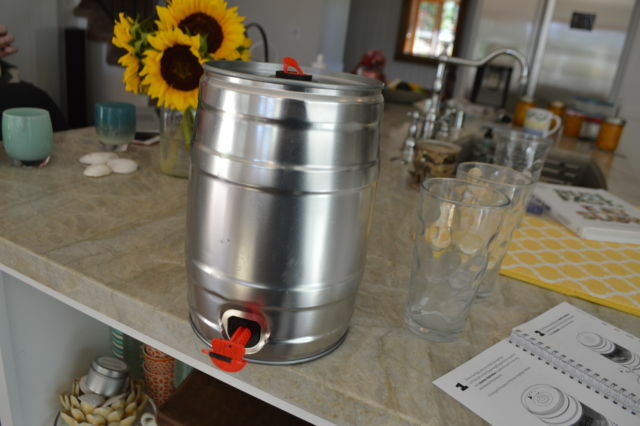 Instead of letting the beer ferment in a more delicate glass carboy, the brewing keg from the PicoBrew Pico has a special seal that passively pressurizes the wort, allowing faster fermentation without ruining the beer. This isn’t a new trick or something PicoBrew invented. Experiments fermenting under pressure are well documented by home brewers, and a 2001 study even documented how yeast growth and ester production changed with temperature and pressure. The home brewing forums I visited didn’t report much of a significant difference between beer brewed in a carboy over a long period of time and beer brewed under pressure. With the PicoBrew Pico brewing such small batches, high turnover is a major advantage. I sat my keg in a warm part of the house and kept an eye on the temperature decal to make sure it stayed in the right range for five days. Now may be the time to mention that, much like the Zymatic, no part of the Pico instructions encourage you to take gravity readings for ABV. Perhaps the company assumes that, by following the appliance's instructions carefully, you’ll come out with a consistent product no matter what. As with the last review, I neglected to take gravity readings on my Pico-brewed liquid. Once the beer fermented, the next step was to put it in a serving keg and carbonate it. PicoBrew sends you all the tools you need to force carbonate your beer in the serving keg, so you don’t need to worry about bottle conditioning unless you want to. Force carbonating in the serving keg only takes about a day. This is also the first time in the process that you have to sanitize anything. Sanitizing is, in my opinion, the worst, most boring part of brewing, especially if you’re the kind of person that gets a little neurotic about the idea of beer-ruining bacteria floating around you, everywhere, threatening to sully your newly sanitized equipment (not that I know such a person). All of the steps prior to the racking process benefit from the Pico’s steam-cleaning rinse cycle, so beer-killing bacteria is of limited concern, according to PicoBrew. I was happy to only have to make a sanitizing mix once. After the serving keg and its corresponding lids and tube were sanitized, I connected one post on the brewing keg back to the Pico and the other post to a tube I would use to empty the keg. Another great advantage of the PicoBrew is you don’t need to do any manual syphoning into your serving vessel—the pump in the appliance moves the beer out through the serving tube for you. 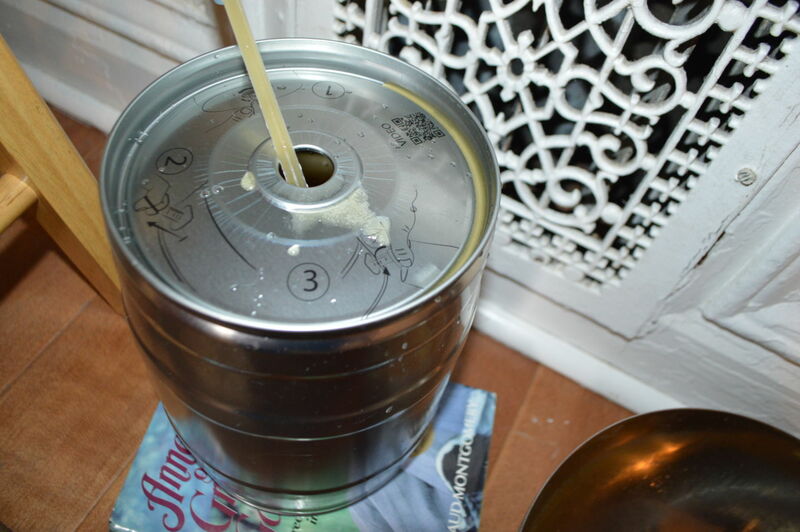 I still had issues with spilling beer as I shifted the tube from my waste bucket to the serving keg (like with manual syphoning, you have to dispose of the trub that gathered on the bottom of the keg). But, all in all, the process was pretty painless. As luck would have it, I didn’t have a day to force carbonate my beer after kegging it—I had to drive from Denver to LA, where I’d be staying for a week. Rather than leave my beer at home—or carbonate the keg and worry about bumps in the road causing my pressurized alcohol to force the flimsy plastic lid keeping the keg sealed to pop off—I decided to bring the uncarbonated beer with me and force carbonate at my mom’s house. I made it to LA, and the carbonation process was straightforward. I screwed a CO2 cartridge into the CO2 regulator, opened the valve to the right pressure, and let it sit in the fridge overnight. The next day my sister came by, and we tapped a remarkably decent beer. That’s not all for the PicoBrew story. Yet again, the company has a new countertop appliance on the way. 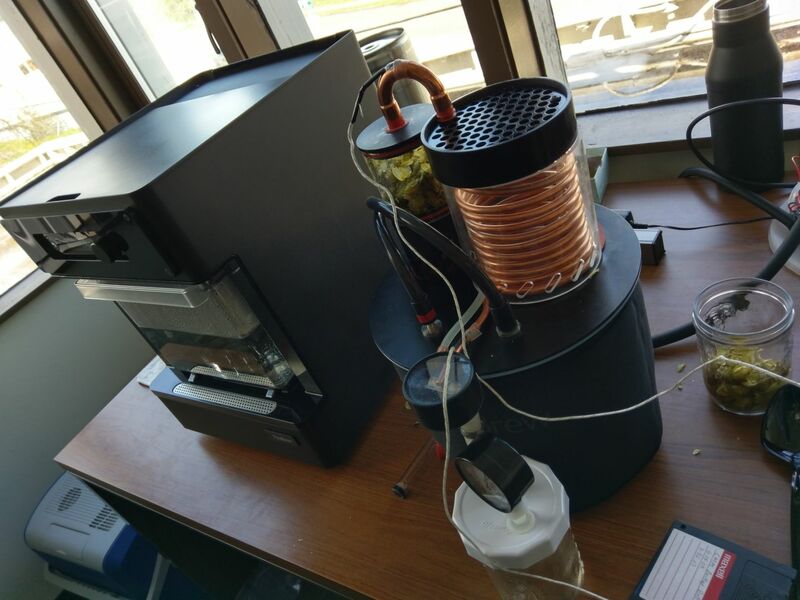 This time, the appliance has a far more sensible name: the PicoBrew C. The company is based in Seattle, so my Ars colleague Sam Machkovech went to a recent press briefing on the latest product. The C will be cheaper than the Pico, at $549, due to how much of the stainless steel on the Pico model has been replaced with black plastic on the C. The digital screen is also smaller, and the brewing keg has been redesigned to eliminate ball locks. As you'll note in the photo above, PicoBrew is also working on a still to help homebrewers get into distilling (“We saw a very, very rough prototype that was being used to distill hop oil,” Sam said). Of course, what you can do with the still is limited by local laws currently. In my state of Colorado, I’m permitted to brew beer and wine and grow cannabis and distill my own essential oils. But I can’t distill even an ounce of my own gin, according to this 2014 article from the Denver Post. The Pico C will also lean more heavily on a specially designed app that will guide a user through the Pak-buying and beer-brewing process. And if you’re into that kind of thing, PicoBrew’s marketplace will soon start selling kombucha-brewing kits that you can use in a Pico or a C model. PicoBrew says the C model and the still will ship in November 2017. Yes, the Pico is hardly perfect, and yes, it still takes a lot of work and about a week and change before you take that first sweet sip of beer. But compared to the Zymatic, the Pico is an impressive next step. We're getting closer to making a coffeemaker for beer. And as I learned from running two failed brewing sessions due to a misplaced lid, the work it takes to set up, brew a PicoPak, and clean the components gets easier and more automatic each time you do it. If nothing else, the Pico is an interesting chapter in how a startup solved an odd engineering challenge. Luckily, it actually does brew decent beer, too. Now, do I think the Pico is a great machine for anyone? Absolutely not. In most cases, you’ll save time and energy just buying your beer in a bottle, unless you live somewhere where you can’t get one of your favorite Northern California brews. While it’s great that the PicoPaks are compostable, having an additional appliance is a waste in itself unless you use it regularly. And if the beer-making process is what you value (because, granted, we all have hobbies that waste money or resources or time here in America), the Pico takes away from the joys of putting together a recipe and agonizing over the details. But the Pico allows a brewer sufficient freedom to make me think this is not a scam—for the right person. You can create beer recipes in the PicoBrew Market, you can use the machine as a sous-vide with the adapter, you can adjust the settings on the machine to favor or disfavor certain characteristics of your beer. You can get wonky on it, if you want. This is a solid iteration after the rather unwieldy Zymatic. You only have to sanitize the serving keg. While you’re constrained from the freedom of traditional home brewing, you can still make adjustments to your beer. The appliance is still large. As far as I know, no man is free of the shackles of biology that prevent instant beer fermentation. There may not be a huge market for this rather expensive beer-making machine. You can’t brew anything but proprietary PicoPaks in this machine.